Yes, He Did. Now What Can We Do? My heart cannot grapple with the Obamas being gone. My brain cannot process the extent of the toady- and corruption-scented void the Electoral College dragged into their place. Confronting this new reality is horrible in an even-kittens-can't-fix-it kind of way (though my current status of living in a one cat household when I'm used to taking my solace under a pile of kitties? That is not helping). Protest, of course -- whether in person, or virtually. While fully embracing our rights to do so. Support organizations that will keep our Con-Artist-in-Chief as accountable as anyone that slippery can be, like the Electronic Frontier Foundation (They have a 100-Day Plan, too. Check it out). Continue to call (if you can) your Senators and Representatives. Calling is gold. Gold, I tell you. Keep your public servants accountable. Rally for top-notch Democratic leadership, so we can dig ourselves out of this manure pile strategically, and effectively. "We need a leader like Perez, a former civil rights lawyer, if we are to protect the rights and well-being of people with disabilities and push back productively against Trump’s discriminatory beliefs, staff, and supporters. We need a Chairman with Perez’s history as a supporter and enforcer of disability rights. We need his proven ability to engage with his opposition constructively, rather than through ridicule or open combat. And we need to understand that Trump’s brazen cronyism and political strip-mining can be most effectively countered by someone with Perez’s personal understanding of the damage an authoritarian leader can unleash on a country. (Perez’s maternal grandfather, formerly the Dominican Republic’s ambassador to the U.S., was declared persona non grata by dictator Rafael Trujillo.)" I am also trying to learn from Seymour, who is tied into news sources and philosophies that fill him with reassurance during trying times. He has been patting my shoulder, a lot. Bless him (sincerely). This reality—of living under hateful, bigoted, ignorant leadership—is an awful one. But we will overcome. If there's anything to be learned from the decades of blood, sweat, and tears civil rights progress that preceded this backslide, it's that we cannot ever stop fighting for our rights. But we still want to know what is disrupting Leo's sleep -- even though we already know sleep disturbances are common for autistic people -- and if it is related to the daytime unhappiness he's been experiencing for almost a year. So we took him in for a sleep study last month, the last in a series of appointments with at least seven specialty doctors and four different scanning/monitoring procedures. 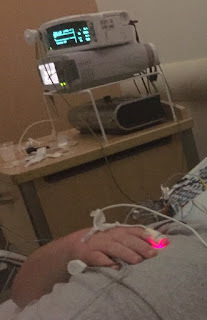 It's been a month since he did that sleep study at a local research hospital, and, according to his referring doctor (who referred him in August, mind you) the results won't be in for another week or so. I'm frustrated, because it's been months and we still don't have answers, but this is also just the way it is. Apparently the sleep study results reading backlog is huge. Just the way it is -- and we have good insurance. And live in a major metro area with world-class medical options and facilities. And are part of a fantastic, responsive medical group. We are 1) lucky, 2) lucky, and 3) lucky. For now. "...the biggest threat to the health care law that we’ve ever experienced. And the stakes could not be higher. All the gains we’ve made in expanding health coverage to a greater share of people and strengthening the health care system in America are at risk." "[Before the ACA] insurers would cover rehabilitation to help people regain functions they had lost, such as walking again after a stroke, but not care needed to either gain functions patients never had, such as speech therapy for a child who never learned how to talk, or to maintain a patient's current level of function. The Affordable Care Act requires plans to offer coverage for such treatments, dubbed habilitative care, as part of the essential health benefits in plans sold to individuals and small groups." And Naomi Kritzer wrote straightforward guidelines on strategic approaches to contacting your Congressional representatives, whether they are supporting policies you agree with or not, and without throwing other groups under the bus. Republicans’ planned bill to repeal the Affordable Care Act (ACA), which is expected to be similar to the repeal bill that President Obama vetoed in January 2016, would provide an immediate windfall tax cut to the highest-income Americans while raising taxes significantly on about 7 million low- and moderate-income families. This is such a distressing time. (Protip: if the current state of politics is as dismaying for you as it is for me and you haven't watched the series Black Mirror yet? Now is a really bad time to start.) It is easy to feel like nothing matters and you can't make a difference -- but you can, and the best way to do it is to take action by contacting your senators and representatives. Even if you think it doesn't matter, it really, really does. Please use the guides above to help you take whatever steps you can to #ProtectOurCare. And thank you. Especially if you'd rather be like Leo, especially if you'd rather Just Keep Swimming. Leo blissfully hanging in a relative's pool on NYE. at night, with city lights in the background.